Donald Trump And Gun Sales: Weapons Purchases, Makers' Stock Prices Have Dipped Since Election Donald Trump won the backing of the NRA and many gun owners by opposing limits to the Second Amendment's right to bear arms, but his election hasn't been good for the gun business. Firearms salesman Nathan Williams at the Outdoorsman gun shop in Santa Fe, N.M., on Jan. 5. Since Donald Trump's election, background checks have fallen three straight months from year-ago levels. But the slump makes complete sense when seen through unusual economics underlying the gun business. Most businesses are influenced by things such as interest rates and consumer confidence. In the gun industry, politics and fear matter. And they matter a lot. Over the last two years, there was plenty of both to go around amid terror attacks and school shootings. And, of course, there was the presidential race, which Hillary Clinton was heavily favored to win. Analysts say when gun purchases quickly spike a clear connection can be made to fear, politics, or both. Sales jump when people are fearful for their personal safety following tragedies such as school shootings or domestic terror attacks. Buyers snap up firearms when politicians respond to those events by calling for stronger gun control. And sales are higher with a Democrat in the White House is in position to pick Supreme Court justices. Since Trump's election, background checks have fallen three straight months from year-ago levels. And shops like Nova Firearms in McLean, Va., have detected a notable drop in sales of certain types of weapons such as AR-15 military-style semi-automatic rifles. During the heat of the campaign, says salesman Tom Jenkins, the shop couldn't keep those weapons in stock. 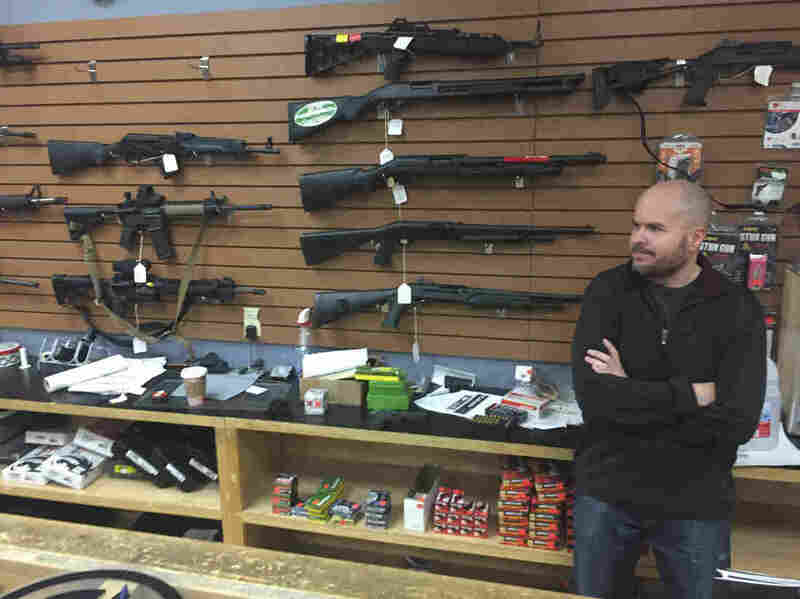 Customers were worried the rifles would be singled out for a ban by Hillary Clinton. "During the political crisis we had dozens of them downstairs, and then there would be zero. And it would go again and then go again. And right up to the election, literally, brought them in, brought them up and sold them." Since Trump's victory those guns aren't moving nearly as fast, says Jenkins, pointing to five AR-15 style weapons on a rack behind the counter of the shop. He says it's a certain type of customer whose buying decisions are influenced by politics. "The hunter doesn't care who's president. The revolver shooter or the target shooter or the competition shooter really didn't care who was president. It's the self-defense market and the people think certain guns may be tied to politics." Jenkins is an ex-cop, former military, a public radio fan, and one of those rare people who talks about Trump's victory without glee or despair. "It was interesting because it was a shock for pretty much everybody, whether you're on the conservative side or liberal side," he says. "It was like, what's going to happen now?" One answer to that question became apparent immediately. "What happened probably quicker than anything is that the gun-related stocks were in freefall," says James Hardiman, an equity research analyst who follows the firearms industry for Wedbush Securities. On the day after the election shares of gun maker Sturm Ruger fell 14 percent. And the price of Smith & Wesson, which has since changed its name to the generic sounding American Outdoor Brands, fell 15 percent. Shares of both companies are still down, in contrast to the overall stock market, which has enjoyed big post-election gains. All of this points to that weird dynamic in the gun business. "I think people that follow this industry know this well, but maybe people that don't, it's a little counterintuitive, but generally Democrats are very good for gun sales," Hardiman says. The fear that Democrats will make it a lot harder to buy guns has never been very likely, according to Hardiman. And the idea that they will ban guns altogether — he calls that pure fantasy. "Nonetheless it's fantasy that has worked in the favor of the gun industry for quite some time," he says. Those fears essentially melted away with Donald Trump's victory. Over at Nova Firearms, Tom Jenkins says politics aren't driving the business right now. Customers are choosy. The basics of supply and demand are at work. "And so for the first couple of months after the election no one's in a hurry anymore," he says.